Some foods are so addictive that they raise the suspicion that they’ve been adulterated in some way. Like the 215 restaurants in southwestern China that were shut down by narcotics police for adding opium to their food. I don’t have any reason to believe that a bubble tea chain in Los Angeles is similarly inspired, but I do know that their product not only caused me to gain 5 lbs in 5 days during a recent visit, but also caused severe withdrawal symptoms. What is bubble tea anyway? Bubble tea is a Taiwanese invention which involves adding spheres of boiled tapioca to a milky sweet drink. It’s also known as “pearl tea” and “boba”. The “pearls” of tapioca are sweet, chewy, and delicious when sucked up through a jumbo-sized straw along with an icy slush of milky tea. If you don’t like tea, there are plenty of other choices, such as almond milk, taro milk etc. in pastel hues of pink and purple. Clearly, this is a drink for the Hello Kitty crowd. I was very resistant to add bubble tea to my list of addictions. I had a bad feeling about it, even as my gourmet brother-in-law extolled the virtues of Half & Half – the bubble tea chain that had taken the San Gabriel Valley by storm. If it was so good that people were standing in line three doors down, then it would surely be my doom (by the way, this is the cardinal rule of thumb for choosing Asian eateries. If there is a line, go and stand in it). The line moved very slowly, but this was mitigated by the ecstatic expressions of the people who came out, sucking on what looked like large tubs of ice cream. I was struck by the size of these containers, which were easily 1.5 times larger than the usual bubble tea container. And that, I was told, was only the “regular”. Certain that the “large” would also make me large, I studied the menu suspiciously. There, I discovered the differences between Half & Half and your average bubble tea store. In addition to honey-soaked tapioca pearls, you can also add black grass jelly and custard pudding. I would never have thought about putting chunks of pudding in a slushy milk drink and telling customers to imbibe it through an oversize straw, but it’s a genius idea! The texture of the drink itself is very rich. “I think it’s real milk!” (as opposed to powdered product) said my brother-in-law. But I’m convinced it’s actually cream. Hence the name, “Half & Half”. I should have put my drink down and run away when I realized this, but it was too late. Glassy-eyed, I had chugged half of it and was already planning my return trip. I must confess that I stood in line every day until our trip was over to get my fix. My husband asked me several times where I was going with the car keys and I could only mumble “I need a drink”. Taking pity on me, he actually drove me there a few times, thus becoming an enabler but avoiding the perils of drinking boba while driving (the container is too fat and wide to sit in a cup holder, so you end up holding it between your knees. Also, there’s so much ice and pure sugar in it that it gives you jitters). Fortunately, our trip only lasted a few more days, but if Half & Half ever opens a store near my house, please don’t tell me. For something cold and addictive (but not sweet), I suggest Jo Nesbo’s “Harry Hole” series. One of the best of the new wave of Scandinavian crime novelists, Nesbo creates chilling scenarios that will keep you reading late into the night. p.s. Los Angeles friends, on September 10, 2013, I’ll be doing an author event at Vromans bookstore in Pasadena – dangerously close to a Half & Half location. If you see me wandering off with a glazed look, please feel free to intervene. I’ve been meaning to try our bubble tea for ages! Yes – and tell us what you think! Bubble tea sounds dangerously amazing! Due to dietary issues, I can’t try it. Maybe that’s a good thing! 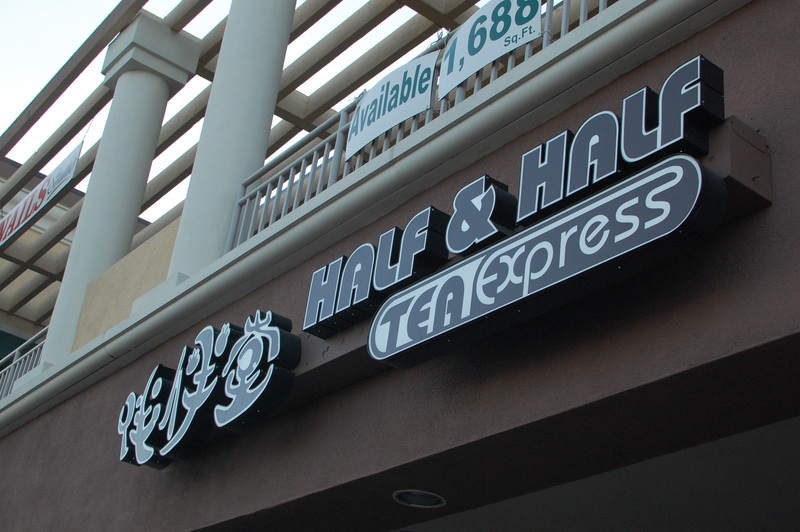 If Half & Half ever decides to extend its tentacles, er, I mean expand its territory, we’ll have to do a bubble tea date! The “Green Bean Smoothie” at half & half is my favorite, even though it’s basically like going to 7-11 and getting a Big Gulp. Ooh, I haven’t got around to trying the green bean smoothie, but it sounds vaguely healthy – do you put pudding in yours? Hi Yangsze! I’m so bummed–I’ll be traveling to Boston on the day you’ll be in LA, so I can’t meet up and bring you a Boba tea. I have a question though–is your novel going to be translated into Mandarin? I think my mom would like to read your book, but she would have an easier time with Chinese instead of English. Nooo!! I’m bummed too (at not seeing you, not the boba tea). Let’s do a SoCal meetup sometime – maybe when Diane is town too? Would be great to see you! My book isn’t out in Chinese at the moment, but if it ever gets translated, I’ll definitely set aside a copy for your mum! This is one of the reasons we go back to LA. Half and Half has ruined every other bubble tea place for me. I don’t even bother with it here in the UK anymore. YS, I still need to know when your NorCal book events are! I’ll be posting a “news” section soon, but right now I have 2 Norcal events – August 15 at Book Passage in the Ferry Building, SF, and August 22nd at Books Inc in Mountain View. Hope you can make it!! I like the sea salt coffee from 85°C Bakery Cafe – do you know it? I have never had the bubble tea with milk before, but I have had boba with mango and that was delightful refreshing! I love bubble tea. We have only one store in Honduras, and it does not sound quite as delicious. I miss my boba tea so much! Became addicted when visiting relatives in Taipei. Stores on every corner! Gained so much weight in one month I couldn’t button my clothes! (but that always happens in Taiwan). Still, I’ll blame the boba. Decided to try every stand and declare a winner after the month. 10lbs later…I found it. Then brought home tapioca balls of my own, but no matter how I followed her instructions on cooking the balls and preparing my tea, I could never duplicate the perfect of the “frog egg” boba stand that won my heart (and stomach). Hmm… sounds like boba tour after my heart! 😉 Yes, it’s quite difficult to prepare the tapioca balls just right. They seem to come out too hard or too soggy. If you’re ever in LA, you should try Half & Half and see how it measure up to your favourite Taipei store – all in the name of “research”, of course! I’m glad you have a “list” of boba bests! Half & Half is so bad yet so good! Am I going to find Bobo tea in China itself??? ?